The best way to play Quadlevel with the computer or your friends is to download and register the ZOG engine. Click on the link above. 1) Notation now shows up correctly with '3D-Federation' style. It also works when you switch sides. 1) Fixed bug that occurred when moving a Rook to the bottom corner square (4d8 or d8L4). 2) Now has rudementary move notation, in the original style. Eventually it will be changed to 3D-Chess-Federation style. I.E) 2c4 instead of c4L2. 1) Compacted .3dc files. For example, the gary3.3dc file that came with the 2.0 package went from 105k to 33k. 2) Easier to click on pieces. No longer forces you to un-click a piece, before clicking on another one. 3) Fixed minor (Ctrl-N) New Game function display problem. 4) Includes a (fools mate) game. 1) No outlined boxes (‘force fields’ as they were termed by others) around the chess pieces. 2) Now supports 800x600 screen mode. 3) Now has a standard windows help screen. 4) A more normal ‘About’ box. Still doesn’t have a chess engine. 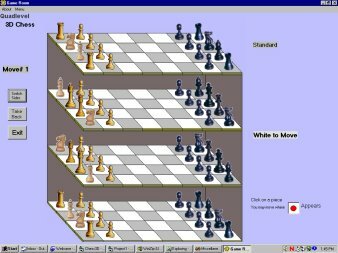 I am looking for a way to convert a standard chess engine to Quadlevel. When completed I will probably put registration stuff in the file and charge a fee for the one with a computer opponent.